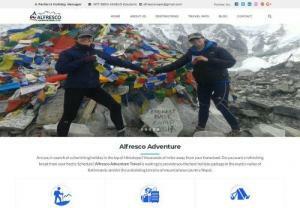 Alfresco Adventure Travel is licensed by the Government of Nepal, Department of Tourism. We are one of the up growing trekking & expedition agency in Nepal. We Alfresco Adventure offer a highly professional and honest service at great value for time by the most sustainable method which is possible. We makes your travel a complete holiday with elements of your imagination. The snowcapped mountains, spectacular green landscape, meandering blue rivers, along with biodiversity and the multi-culture.